After the immediate smash of fluent virtuosity, the first thing to be noticed on listening to The Blinding Light Of Faith, is that these riffs talk. Superlative twin guitar layering seems to drag the listener down a frantic rat’s path, guided by the infamous and filthy survivor of many dark histories. A labyrinthine race for life through a besieged city of fire and shrapnel. While previous releases were indeed brimming with enthralling technique and craftsmanship, TBLOF delivers a new world, scaling buffeting towers and scouring mouldering sewers. The lyrics match this perfectly, pitching the arrows of accusations at all of “the corrupt organised religions of the world”. From bullets to ballistas, The Crusades never truly ended. This album tells the tale, instrumentally and verbally. If the likes of Bloodbath‘s epic The Fathomless Mastery, or the Eastern beast, Melechesh‘s Enki fill your blackened heart with death metal joy, this platter is a must have addition to your library. It is nigh on impossible to pick fault. Even the off-the-wall application of some classic prog breaks is a tasteful lull in the furious storm of lead and steel. Originally unleashed via Transcending Obscurity Records in May, this sprawling effort is now creeping its way towards a limited vinyl re-release, just four months later. Perfect timing, considering they have just laid waste to the Sophie stage at Bloodstock Open Air. Remastered to achieve optimal results with the format, copies will be split between 200 clear orange, and 100 red/black marble. 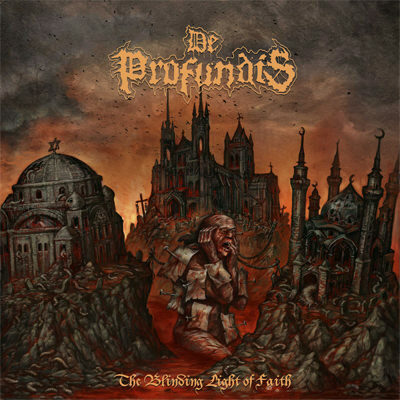 De Profundis are at the top of their game here. There’s no questioning that this album is an extreme metal pinnacle, and you’d be a fool not to own it in some format. Vinyl is possibly the nicest. Posted in Latest News, Reviews and tagged Bloodbath, De Profundis, Enki, Lusitanian Music, Melechesh, Reviews, Slow Dragon Music, The Blinding Light Of Faith, The Fathomless Mastery, Transcending Obscurity.